Third Echelon’s old posterboy goes in search of retribution. Our hands-on with Ubisoft’s fifth Splinter Cell. 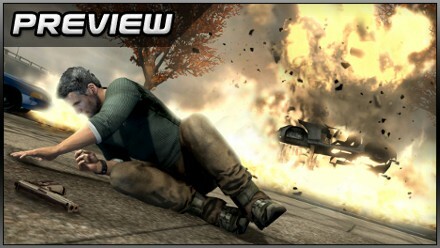 Splinter Cell: Conviction has the mother of all tutorials. Or rather, father. Scuttling from over-turned table to over-turned table in a Maltese marketplace, following the ear-mic directions of old comrade Anna Grimsdóttír, the lately out-of-retirement Sam Fisher reacquaints himself with some basic stealth dynamics by way of flashbacks to his infant daughter’s bedside. Darkness, the grizzled assassin explains to sleep-deprived Sarah, has its uses. Not wishing to give his offspring night terrors for life, he doesn’t go into much detail, but veteran Splinters will be well attuned to the violent current beneath these paternal reassurances. That undercurrent soon bubbles to the surface, as you road-test the new ‘Mark and Execute’ mechanic mid-flashback on three unfortunate housebreakers, queuing up headshots with right bumper and loosing the rounds in a split-second with Y. 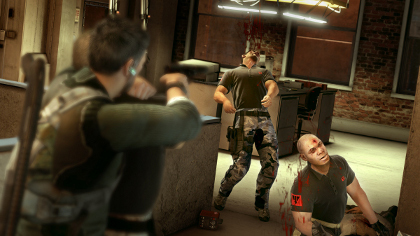 This smooth interweaving of exposition and interaction is typical of the new game, with pre-rendered plot points and objective data mapped, home cinema style, onto flat surfaces as you approach them in real-time, tactics reminiscent of Heavy Rain’s object or limb-tethered button prompts. If you can smell a psychological dimension to Ubisoft’s stylised approach, you should trust your nose: in the three levels we encounter at the press event – marketplace, mansion house and military airfield – Fisher’s surroundings are occasionally crowded by painful remembrances, monochrome snapshots of tombstones, the whisper of ambulance sirens. Later on, a villain harangues us from the security of a projected image and there’s a moment, just a moment, in which we confuse this nebulous threat with another figure from Sam’s past. Sarah’s affection, it transpires, was one of the few things keeping the man’s murderous leanings in check in the wake of Splinter Cell: Double Agent (“What did you do, daddy?” she asks, appearing at the bedroom door, and he sheepishly hides the gun at his side). Deprived of that affection by a road accident in which Third Echelon, his old employer, may have a hand, he’s become an utterly ruthless rogue cannon, operating in the pitch-black regions beyond even the secret agent’s muddy code of conduct. Our Xbox 360 demo build sported noticeable tearing and frame rate dips. This aside, Conviction looks decent. The new interrogation sequences, of which we get to sample two, are obviously symptomatic of this departure. Scripting is again cleverly intermingled with brutally hands-on play as we throw a jabbering skinhead around a toilet, mashing his head through the slats of a cubicle and cracking it against the sink, the game restraining us at intervals for just long enough to let another plot morsel dribble from our victim’s bloodied lips. Also symptomatic, perhaps, of Sam’s righteous savagery is the game’s relative action heaviness, playing down the careful monitoring of view cones and light levels that characterised earlier Splinter Cells in favour of adaptation on the fly. Cover points, handholds and goons within reach of a fatal headlock are picked out by HUD elements for maximum convenience, and our hero is a lot quicker than his advancing years should allow, whether he’s shuffling palm over palm along a ledge or scaling a wall pipe. Fans of the previous games will doubtless be crying havoc at all this, and it’s hard to know how to soothe their fears. Splinter Cell has become something different, a flashpoint-dotted escapade across moody but easy-to-read sandbox environments, asking less of the player’s capacity to analyse an area but counter-balancing this with greater pace and more sophisticated presentation. Posted in Previews, Spotlight, and tagged with Europe, North America, PC, preview, third-person, Ubisoft, UK, Windows, Xbox 360, Xbox Live. the mark and execute, might not be to everyones taste but it is damn slick. you can actually use the gadgets/grenades etc which were useless in previous splinter cells. But, on the other hand, even on realistic, the guys in a room at the end of the demo can’t see you a few feet above them on a railing…directly in front of them. Needs sharper Ai in areas of the game to give it some challenge imo…seems like a fun procession, as many games are, but it’d be good to have some challenge. Am hoping realistic and hunter mode with the enemy desnity turned up can provide this…to it’s credit though at least because it flows there’s a buildup of pacing, unlike quicksave, sneak, reload save, which for me was getting tiresome.